What they do all day? Patients who undergo surgery have to be given anesthesia so they don't feel pain. Nurse anesthetists assess patients prior to surgery, administer anesthesia, and monitor vitals during surgery. They also oversee the patient's recovery, and ensure they are pain-free and safe. --J.A. 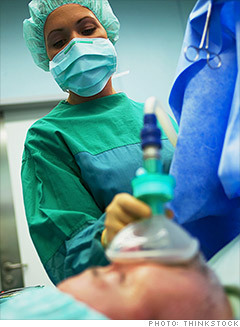 Do Nurse Anesthetists have great jobs, or what?